This species is accepted, and its native range is Eritrea to Zambia, Yemen. Glabrous shrub, 1–3 m. tall. Young branches partially tinged dull red-brown, with many short shoots, 3–10(–15) mm. long, subtended by 3–5-fid spines; spines 1–4 cm. long, sulcate below. Leaves crowded, shortly petiolate, 3-foliolate; lateral leaflets very reduced, subulate or filiform, 1–3(–4) mm. long, persistent; terminal leaflet oblanceolate to obovate, 2.3–7 cm. long, 0.9–3.8 cm. wide, mucronate, entire or usually with several to 20 spiny teeth, coriaceous; venation open reticulate, with the lateral veins very oblique at the base, more spreading above; petiole 1–2 mm. long. Inflorescences of 8–15(–24) flowers in little-branched irregular panicles, 2.5–7.5 cm. long; bracts mostly narrowly triangular, up to 5 mm. long, with the lowermost ones often large and leafy. Flowers yellow, sometimes tinged red; perianth-segments in 5 series of 3; inner sepals the largest, spreading, rounded at the apex, 6–7 mm. long, 4–4.5 mm. wide; petals 6, brighter yellow, obovate, 4.5–6 mm. long, 2–4.5 mm. wide, with 2 glands near the base. Ovary narrowly ellipsoid, with 2–4–6 ovules. Berry ellipsoid, 8–12 mm. long, 6–7 mm. across, plum-red to dark purple, pruinose, perfecting 1–4 seeds. Seeds 5–7 mm. long, 2–3 mm. wide, brown, finely rugulose. Open upland woodland, edges and glades of upland rain-forest, upland evergreen bushland; 1500–3450 m.
Glabrous shrub up to 3 m. tall; branches purplish when young, sulcate, with 3-partite spines up to 4 cm. long. 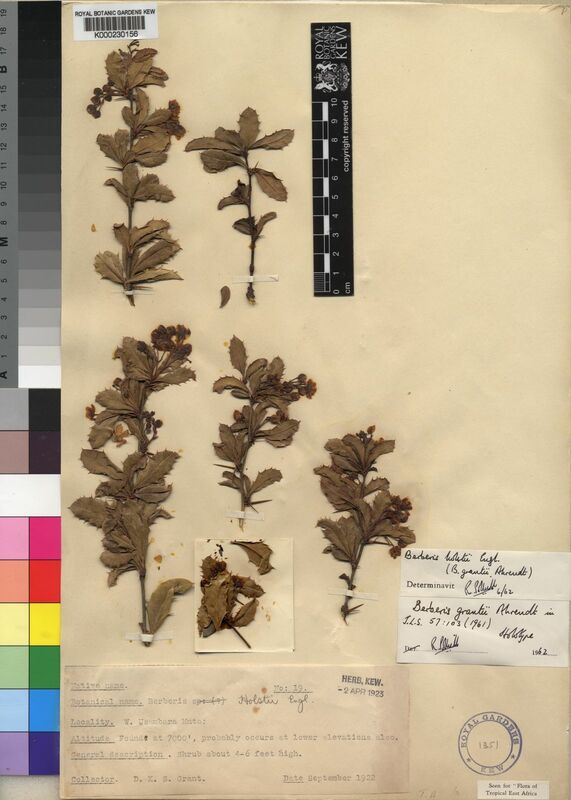 Leaves usually clustered on short lateral shoots, almost sessile, apparently simple but in reality 3-foliolate with a normal, terminal leaflet articulated at its base and a petiole of c. 1 mm. long bearing 2 subulate lateral leaflets 1–3 mm. long at its apex. The petioles and subulate leaflets are characteristically persistent on the short shoots; lamina of terminal leaflet up to 6 x 2.7 cm., coriaceous, oblong or oblanceolate to obovate, midrib produced as a short prickle, margin prickly-dentate or more rarely entire, purplish when young and somewhat glaucous below. Flowers yellow, in axillary racemes or cymes up to 5 cm. long; bracts c. 3 mm. long, lanceolate-acuminate. Sepals increasing in size towards the interior, smallest c. 2 x 2 mm., largest c. 6.5 x 4 mm., ovate to broadly ovate, rounded at the apex. Petals somewhat smaller than the inner sepals, obovate, with two linear glands near the base. Stamens on stout filaments c. 2 mm. long; anthers c. 2.5 mm. long, oblong, opening by a pair of spreading wing-like valves 1.5 mm. long, hinged at the apex of the anther-thecae. Ovary narrowly ellipsoid, c. 4-ovulate, with a broad capitate subsessile stigma. Berry c. 1.3 x 0.7 cm., ellipsoid, dark blue, pruinose, with a persistent stigma. Seed c. 6 x 3 mm., usually solitary, ellipsoid, brown, rugulose. Ahrendt in Journal of the Linnean Society of London, Botany 57: 102 (1961). Dale & Greenway, Kenya Trees and Shrubs p. 58 (1961). Wild in Flora Zambesiaca 1: 171, t. 24 (1960). Milne-Redh. in Mem. N. Y. Bot. Gard. 8: 215 (1953). J.P.M. Brenan, Check-lists of the Forest Trees and Shrubs of the British Empire no. 5, part II, Tanganyika Territory p. 70(1949). Battiscombe & Dale, Trees and Shrubs of Kenya Colony p. 9 (1936). Sprague in Hook., Ic. Pl. 31, t. 3021 (1915). Engl., Die Pflanzenwelt Ost-Afrikas und der Nachbargebiete, Theile C: 181 (1895).